Trident 7 Wayne Findlay SVBK, Other Shape Guitar from Dean Guitars in the Artist Signatures series. 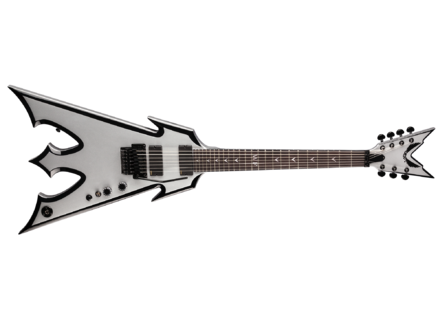 Dean Guitars introduces the Trident 7 Wayne Findlay SVBK, the new signature model of Wayne Findlay from Slavior and the Michael Schencker Group. Dean Guitars releases a new 7-string signature model dedicated to Wayne Findlay. Compared with the previous version, the new finish is not the sole difference as it is also equipped with a different Floyd Rose bridge model. U.S. MSRP is $1199. More details at Dean Guitars' website. Fret-King presents John Jorgenson signature model Fret-King introduces the Black Label ‘JJ’ John Jorgenson Artist signature model. [NAMM] [VIDEO] New Roland tone capsules & amp At the NAMM, Roland has released a new Tone Capsule for its Blues Cube amps, and introduced a new amp: the Blues Cube Hot. [NAMM] [VIDEO] Vox Starstream Type-1 A demonstration of Vox's newly introduced Starstream Type-1 modeling guitar.